We simply adore the Crown of Thorns! One of our top favorites that blooms all year round in our tropical garden, never ceasing to brighten each day with its striking and brilliant red clustered bracts. We have grown them since year 2002. Amazing plant, so hardy and very floriferous! 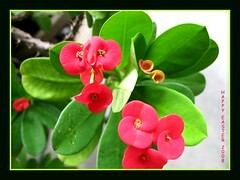 Common Name: Crown of Thorns, Christ Plant, Christ Thorn, Christ Crown. Plant type: A flowering perennial succulent, native to Madagascar. Light: Full sun for best performance, though can tolerate partial shade. Moisture: Needs regular watering and moderately. Do allow top soil to dry out between waterings. It can be drought and heat tolerant once established. Soil: Grows best in well-drained loamy soil though can thrive in a variety of growing medium. Propagation: The most viable method of propagation is by stem or tip cuttings – trim the stem tips or unwanted stems into 4-5 inches length with a sharp knife, place cut ends in water to stop sap bleeding and let them dry for 3-4 days to callous, then push them into well-drained potting medium. Locate in a sun-filtered area, water moderately and they should show new growth in about a month. Other ways of propagation are from seed, grafting, air-layering, pups and leaves as mentioned in great detail at this very educative site. 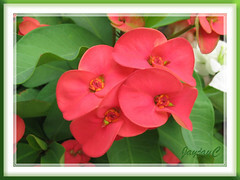 Features: Euphorbia milii is a succulent deciduous shrub with a slow to moderate growth rate. It grows to a height of 4-5 feet and spread of 2.5 feet, though dwarf hybrids are less than 1.5 feet tall. Typically, it has strong, upright and heavily branched spiny stems with 1 inch long straight thorns and obovate leaves that are medium to dark green of variable sizes. Plant may defoliate due to moisture or temperature stress, thus leaves are primarily found on new or extended growth. Its main attraction are the large and brightly colored bracts (modified leaves) that come in many varying shades of red, pink, white, yellow, orange or multi-colored with the actual flower in the center. Flowers called cyathia (singular: cyathium) are small and inconspicuous and surrounded by five nectar glands that are sometimes beautifully colored in contrast to the striking bracts. Bees and ants are attracted to these nectar producing flowers. The inflorescence of the Euphorbia milii are often times compared to Hydrangeas and are held well above the green foliage at terminal stems or at axillary sources. China and Thailand started hybridization of Euphorbia milii in 1990 and to date there are so many astounding hybrids and cultivars in a huge range of bizarre and exotic flower colors in a varied range of sizes with variable number of flowers in each cluster. 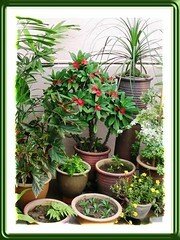 Even plants come in variable heights that can be dwarf, compact, regular or large. 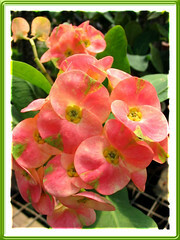 The old Euphorbia hybrids typically have eight flowers in each cluster, hence the name Poysean given to Euphorbia milii by the Chinese immigrants in Thailand, referring to the eight saints of Chinese mythology, each one representing a different force: health, bravery, riches, beauty, art, intelligence, poetry and the ability to overcome evil. 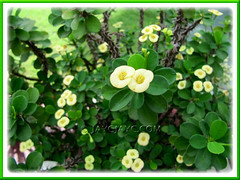 Thus, Poysean is extremely popular in Thai homes as a symbol of good fortune! On the other hand, the common names of Crown of Thorns, Christ Crown/Thorn allude to the legend that the crown of thorns worn by Christ at the time of his crucifixion was made from stems of Euphorbia milii. 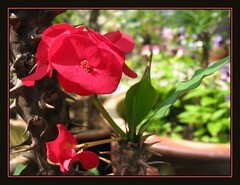 Usage: Crown of Thorns is excellent as a houseplant or indoor container plant or in a mixed planter. Very ideal too as an accent plant for patio or outdoor garden, whether as a stand-alone or in a mixed border with other drought-happy plants. It is used extensively as a landscape plant and can also be used for borders and fences to ward off undesirable visitors. It is drought and salt tolerant, thus ideal to be planted along coastal areas. Great plant to attract butterflies and bees too. Care: Christ Plants are such fuss free perennials and truly tough. With adequate sunlight or bright light and water, they’ll delight you with a continuous profusion of stunning blooms all year round. You may want to fertilize occasionally to promote blooms. Deadheading is not required as the colored bracts will dry and fall off itself. Pruning is hardly necessary as it grows very slowly and is quite compact in habit. It does tolerate pruning very well, so an occasional pruning is recommended to promote more branching and bushiness. No serious pests or diseases, though it can be susceptible to mealy bugs and whiteflies if grown indoors. As with most Euphorbia, when cut it exudes a milky sap that is toxic and can produce skin allergies to susceptible individuals, so wear gloves if applicable. To know further on Euphorbia milii cultivation, visit Tropica Nursery for hands-on expertise. For temperate zones: Hardiness: USDA 9b-11. Refer to Dave’s Garden for more information. 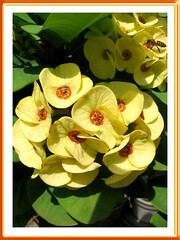 thanks for this very informative article about euphorbia. I have recently bought a euphrobia milii. Your article has helped me understand its culture. I am delighted to have come across this article. I would really love these Crown of Thorns except for the thorns. I found they are quite sharp & difficult to handle especially when replanting them. 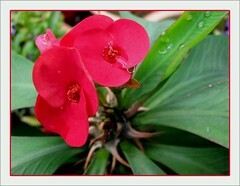 Somehow, I’m still thinking of getting this one, those beautiful red flowers. We love these plants. Though thorny, they’re such compact and slow-growers that you won’t need to handle much or repot for years…probably only when its top heavy and topple the pot. That too, we’ll just crack the pot to repot with ease. However, we noticed that they don’t take easily to transplanting, so must handle with care. However, the main stem has gotten bigger than I like. It started off probably six inches high and now is close to 2 feet. Can I chop 12-18″ off it without killing the plant? You’re most welcome, Dylan…there’s much pleasure in sharing! Yes, you can prune without fear since the roots are well-established, but do so with a very sharp knife so that the roots are not unduly shaken. I have around 20 pots of euphorbia milli in various colours. I live in Kerala, India. The plant blooms profusely. Its a joy to see them. I am slowly mastering the art of propagation. Thanks a lot for your valuable info. Thanks for your appreciation, Accachy! Wow! 20 pots of varying shades…that’s awesome! I would appreciated any information on where in the U. S. I can purchase the large flower variety of the crown of thorns plants. Thanks. 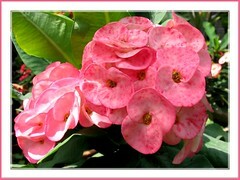 Where can I buy the seeds of Euphorbia Milii var.Splendens from flower company or garden in USA. Can you please provide any information on where this lovely plant can be purchased within the US?